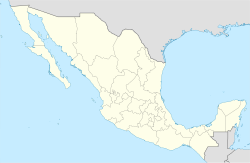 Ciudad Juárez is a city in the Mexician state of Chihuahua. About 1,300,000 people live in Ciudad Juárez. This makes it the fifth largest city in Mexico and the largest city in Chihuahua. It is at the border to the USA, opposite El Paso. ↑ "elpasoredco.org". Retrieved August 26, 2016. ↑ "Juárez". Catálogo de Localidades. Secretaría de Desarrollo Social (SEDESOL). Retrieved April 23, 2014. This page was last changed on 9 April 2018, at 07:04.